Buildings today are complex concatenations of structures, systems, and technology. Over time, each of the components inside a building has been developed and improved, allowing modern-day building owners to select its features independently. Smart buildings go well beyond just using smart materials and protocols. So, what exactly are these? A smart building uses information technology to connect a variety of subsystems, which typically operate independently, so these systems can share information to optimize total building performance. Enabled by technology, this smart building connects the structure itself to the functions it exists. That said, smart buildings look beyond the building equipment within their four walls. The Smart Buildings Summit got underway in Hotel Four Seasons, Mumbai, on August 21, 2015. 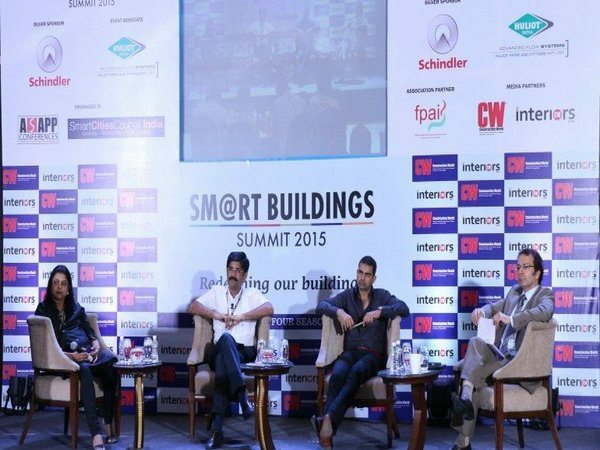 Organized by CONSTRUCTION WORLD and Smart Cities Council India, the summit’s theme was “Smart Buildings: Redefining Our Buildings” with the involvement of 12 speakers and 5 high-powered sessions. Mr. Padode, as moderator, touched upon building automation, which already exists, but which has a cost involved, delving deeper into building information modeling (BIM), building maintenance system (BMS) and geographic information system (GIS). Other panelists included architect Sanjay Puri, Chetan Raikar, Chairman, and Managing Director, Structural Consultants and Sonali Dhopte, Director, Excelize. During this panel discussion, the need for using Smart Building Technology was discussed. Using BIM during the design phase for coordination and then using the data from this model during operation stage of a building is one of the ways the buildings can be made smarter. This was discussed by the panel in relation to solar analysis and temperature control in any building, water meters and recycling water and using innovative construction techniques to make buildings smarter.